It’s been on my “to-do” list for a while to finish reading the three children’s books written by Maud Hart Lovelace that I haven’t yet read. Since we are planning a trip to California later this year, What Cabrillo Found seemed like a great choice. I also just realized recently that our library does, in fact, own circulating copies of this book (I had it confused with another book that our library only holds a reference copy of). What Cabrillo Found is a fictionalized biography of Juan Rodriguez Cabrillo, the first European explorer to navigate the coast of what is now California. Lovelace’s account of Cabrillo begins when Cortes first sails for Mexico, and Cabrillo joins in with that expedition a year or more after Cortes would have first arrived. After Mexico was subdued, Cabrillo was sent on an expedition to Guatamala. Years later, he was part of an expedition traveling north to explore along the coast of North America, where he and his two ships finally pass the furthest point where European explorers had previously ventured, into what is now California. Miss M and I found the style of What Cabrillo Found to be a bit unusual. Paragraphs of historical narrative that could have come out of a nonfiction book about early exploration and conquest were mixed in with stories and dialog (clearly imagined by Lovelace). In her author’s note, Lovelace says she tried to make her story as accurate as possible, and I am sure it was as accurate as it could have been when she wrote it in 1958. A quick check of other sources shows that some elements of her story don’t reflect what is currently known about Cabrillo — such as the fact he was very rich, when is portrayed in the story as being more of an “average joe” who was somewhat successful in his military achievements. Of course, opinions about how the Conquistadors acted in Mexico and Central America has changed for the worse over the years. I thought Maud Hart Lovelace’s presentation of the actions of Cortes and the other Conquistadors was fairly balanced — almost surprisingly so for a book written nearly 60 years ago. I thought perhaps this book was old enough to be from an era in which explorers were universally glorified. She definitely condemns the cruelty of the Spanish, while also portraying that, besides greed, the Spanish did have some noble motivations of wanting to put an end to human sacrifices and share Christianity. 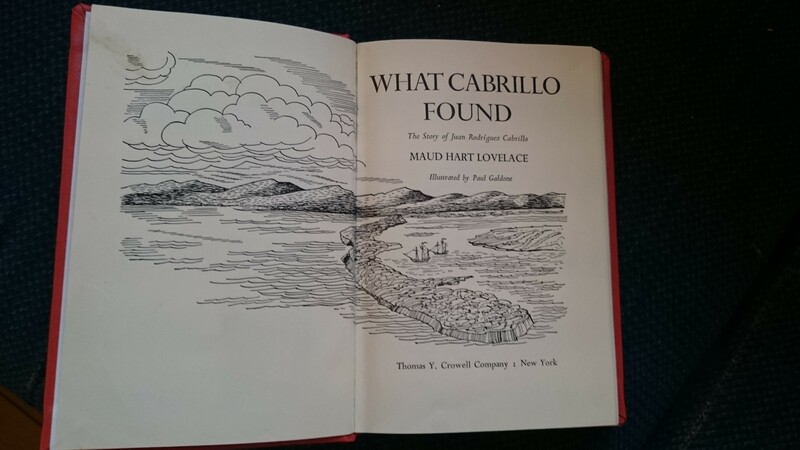 I can see why, perhaps, What Cabrillo Found has yet to be reprinted — I’m not sure many of today’s readers would appreciate Maud Hard Lovelace’s perspective on the Conquistadors. What Cabrillo Found (If you can find a copy of it) might make an interesting addition to a study of early explorers or California history — as long as you balance it out with more modern resources as well. Miss M and I are now anxiously awaiting word from the Interlibrary Loan deparatment of our library as to whether they can locate for us a circulating copy of Maud’s rarest children’s book, The Tune is in the Tree. Up until recently, my searches of the ILL database were not fruitful, but I tried searching a bit differently this time and I think I found a couple possibilities. Our fingers are crossed! We’re also looking forward to reading more historical fiction set in California in the coming months as we count down to our vacation!